PROJECT: Name a breakthrough non-volatile storage memory technology. 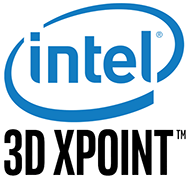 3D XPOINT: Pronounced “3D cross point,” referring to the structure of the memory cells. BRAND POSITIONING: We helped our client Intel create the name 3D XPoint for this breakthrough new storage memory technology. Intel 3D XPoint storage memory technology delivers faster performance and greater power efficiency at lower cost across a range of products from SSDs, to servers, 2 in 1 PCs and tablets. This ingredient brand technology makes other storage chips better by unlocking enormous memory capabilities and speed at low cost. Data is persistent (non-volatile), meaning that when you shut off the power, the data isn’t lost, as with RAM/Flash memory. The name for this technology had to send the signal that the products incorporating it are a generational, revolutionary advancement of Intel innovation, while driving brand-building equity more to the “Intel” masterbrand than to the technology itself. 3D XPoint perfectly serves this purpose. 3D XPOINT has is an integral component of Intel’s new Optane technology.